We only stock reliable and trust worthy water treatment methods, and this is exactly what you get with Pyramid’s Biox Aqua Drops or Tablets. They are made using Chlorine Dioxide, which has more than double the strength of most water treatment methods made using Chlorine. and I was fine, no upset stomach so guess it worked fine. There was no bad after taste and i would use the tablets again with confidence." 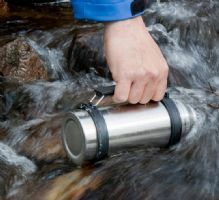 Simply follow this step by step guide to get clean drinking water, wherever you are in the world. Always treat your water first, if you suspect it is unsafe to drink. It is recommended to strain the water through a cotton material such as a t-shirt to remove visible dirt and larger particles. Simply drop one tablet per litre into the water. If the water is extremely dirty, try adding two tablets per litre. One pack contains enough tablets to treat 30 litres of water. Mix 12 drops from each bottle into a bottle cap and leave the mixture to react until it turns yellow. Then add to 1 litre of water. One pack contains enough drops to treat 60 litres of drinking water. Shake the bottle well and let it stand for 10 minutes before drinking. Your water is now safe to drink!